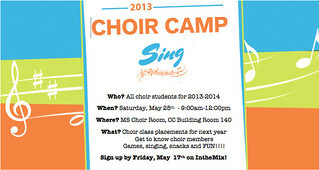 If you sign up for choir, we will be having a Choir Camp on May 25, from 9-12. Click HERE to sign up. If you are unavailable on the 25th, please e-mail Ms. Peterson (coleenp@isb.ac.th) to make arrangements for her to hear you at another time. This entry was posted on 09/05/2013 at 11:12 AM and is filed under Arts, Events, Middle School. You can follow any responses to this entry through the RSS 2.0 feed.